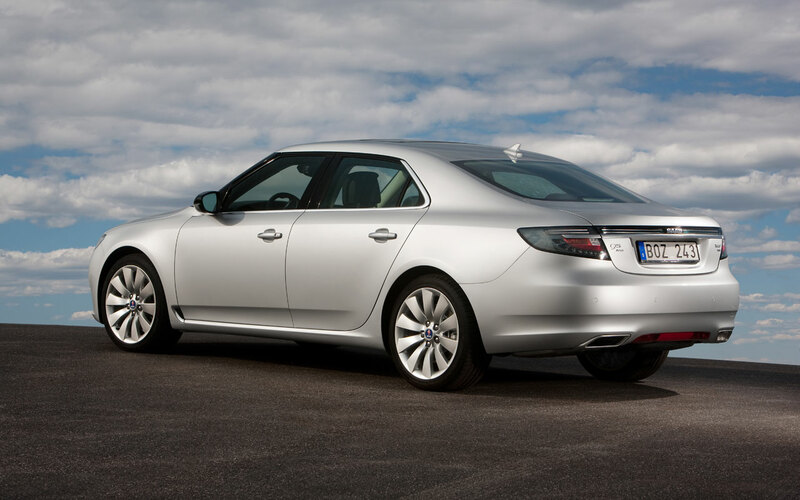 The all new Saab 9-5 sedan signals the start of a new era for the Saab brand. Sleek, sophisticated and unmistakably Saab, it combines stand-out looks with advanced technologies and brings a fresh alternative choice to the premium sedan segment. The clean, sculpted shape embraces the purity of Scandinavian design and its dramatic wraparound window graphic echoes Saab’s aviation heritage. With frontal styling inspired by the award-winning Aero X concept car and a muscular, low-slung stance, the new 9-5 heralds the introduction of a bold, more expressive design language. The array of high-tech features on offer includes: an aircraft-like head-up information display (Pilot HUD); adaptive lighting (Bi-Xenon Smart Beam); adaptive cruise control; Saab DriveSense adaptive chassis with real-time damping control; keyless entry and starting; tri-zone air conditioning; dynamic parking assistance and Saab XWD with a rear eLSD, the industry-leading all-wheel-drive system. The all-turbo powertrain line-up starts at 1.6 liters and carries forward Saab’s rightsizing engine strategy, which focuses on responsible performance through the development of highly efficient and relatively small four cylinder turbo engines. There is a choice of three fuels - gasoline, diesel and E85 bioethanol – and with diesel power, the new 9-5 offers CO2 emissions as low as 139 g/km. The face of the new 9-5 is defined by a deep grille flanked with curving, ice-block headlamp units. The entire glasshouse is presented as a ‘wraparound’ mono graphic, the disguised windshield and side pillars giving the cabin Saab’s signature cockpit look. Squint slightly, and the proportions of the windshield and roof become reminiscent of the classic 900 model. Viewed from any angle, the all new 9-5 cuts a strong and powerful stance. The ‘organic sculpture’ of the low-slung body blends clean, uncluttered lines with natural, curvaceous shapes. Brand design cues are evident in the ‘hockey stick’ belt-line, the strong rear C-pillars and the fuselage-smooth surfacing of the bodywork. The large Saab logo embossed in the center of the grille characterizes the more assertive, self-confident design language. The car’s dynamic character is emphasized by a falling roof-line that culminates in sweeping rear pillars which buttress a slightly recessed rear screen. Latent energy is conveyed by fenders that are subtly pulled out to melt into the wheels. Below that smooth, flat rear deck, a full-width, ice-block rear light bar wraps into signature lighting. The new 9-5’s overall proportions stretch the traditional three-box sedan silhouette, while avoiding the fastback cliché of a four-door coupé look. Inside the spacious cabin, simple forms define its architecture and echo the design purity of the exterior. Compared to its predecessor, legroom is increased both front and rear. The choice of materials, the fit and finish and the tactile quality of the controls all reflect the new 9-5’s premium appeal. The driver-focused cockpit is traditional Saab, while its execution is all new. The deep center console sweeps up at a shallow angle around the driver into the main instrument display, which is topped by a neat ventilation zone. Deeply recessed main dials include a rolling ‘altimeter’ speed read-out, a reference to Saab’s aviation heritage from the Aero X concept. 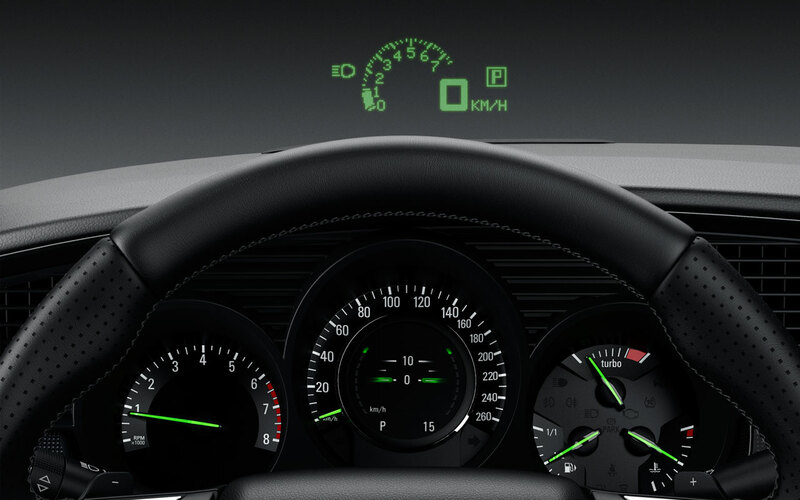 Driver displays, including the optional head-up display (Pilot HUD) in the windshield, are predominantly illuminated in signature Saab green and have a crisp, floating appearance. The car’s ignition, now a start/stop button, remains between the front seats, next to the gear shift. Infotainment choices include a top-of-the-line harman/kardon surround sound audio system and an 8-inch touchscreen navigation system with hard disk storage for map data and 10 GB of jukebox-style music files. A large center console provides stowage and connections for several portable devices through USB and Aux ports alongside a 12V power outlet. Rear passengers can access their own audio or watch a DVD. The rear seat entertainment unit in the back of the center console accommodates audio controls and fold-out viewing screens are installed in the front seat-backs. Wired and wireless headphones are provided for listening and viewing. The rear seat entertainment unit also includes twin air vents and an independent temperature/fan speed control for the rear cabin, in addition to the dual zone air conditioning up front. An array of chassis technologies is focused on delivering a sporty, rewarding driving experience that belies the 9-5’s size. Saab XWD, the industry-leading all-wheel-drive system, already available on the Saab 9-3, is offered with all engines except the 1.6-liter gasoline and 160 hp turbo diesel. Available throughout the range is adaptive chassis control with driver settings selection through Saab DriveSense, Bi-Xenon Smart Beam adaptive lighting and intelligent cruise control. Three different suspension combinations are factory-fitted according to engine power and are also available with a sport chassis setting. Saab has some 30 years experience in turbocharging engines and the all-turbo powertrain line-up in the new 9-5 further develops Saab’s rightsizing engine strategy. The gasoline choice comprises a 1.6-liter turbo developing 180 hp, a 220 hp 2.0-litet turbo with direct injection, and a range-topping 2.8V6 turbo generating 300 hp and 400 Nm of torque, offered exclusively with Saab XWD. 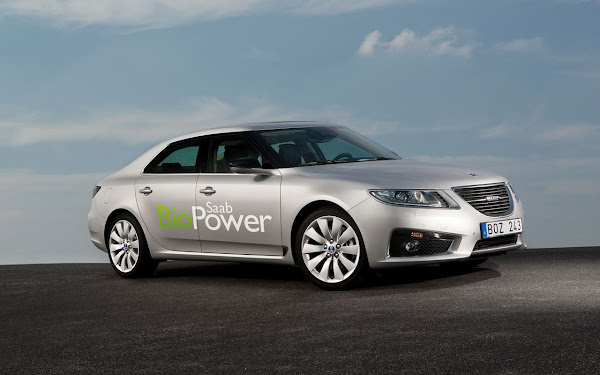 An E85-capable Saab BioPower version of the 2.0-liter engine is also available. Two 2.0-liter turbo diesel engines are offered: a 160 hp, single turbo unit delivering CO2 emissions of just 139 g/km, and a 190 hp version with two-stage turbocharging, which is available with front wheel drive and Saab XWD. 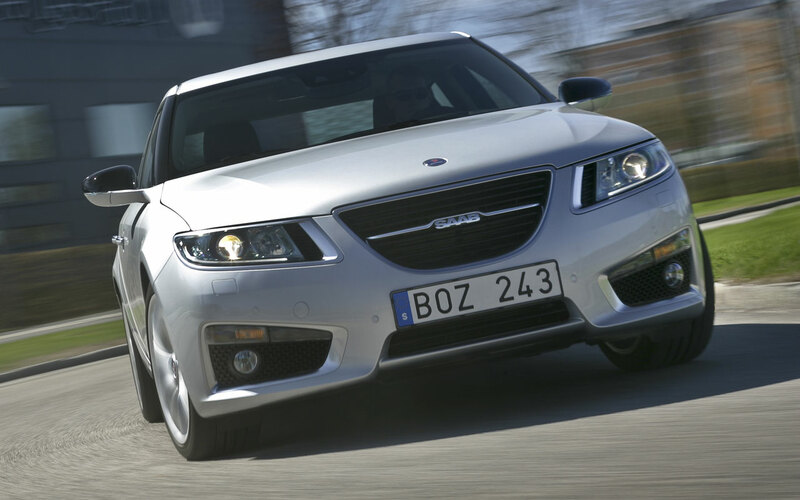 This is the first time Saab has combined diesel power with its advanced all-wheel-drive system. 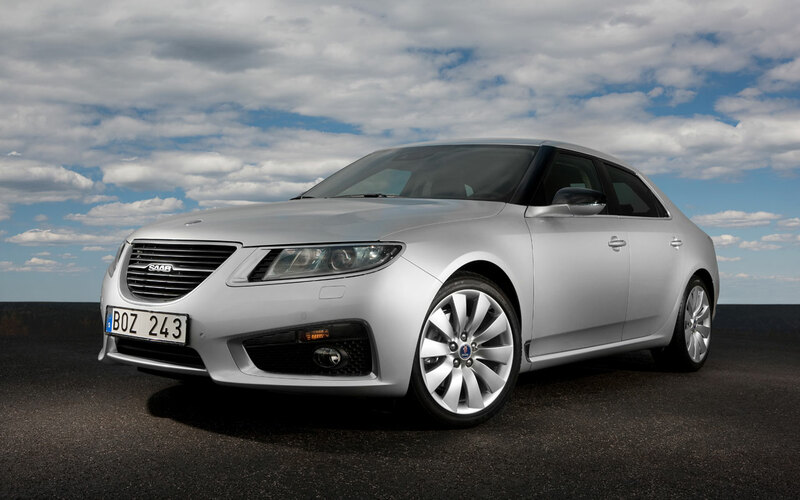 Defined and equipped by Saab as its top-of-the-line contender in the premium sedan segment, the new 9-5 is the most technically advanced car ever produced by the company. It is being built at Saab’s home plant in Trollhättan, where it has been engineered and chiefly developed.